Jane Lythell explains how she used her holiday journal as source material for her novel After The Storm. After The Storm is about two couples who set off together in a 37 foot boat after knowing each other less than 24 hours to sail to a paradise island in the Caribbean Sea called Roatan. What happens during their sail there and the events on the island will test the four characters to their limit. As a novice sailor I did that sail of 138 miles from Belize City to Roatan. I could not have written After The Storm without that first-hand experience. Some writers are able to create imaginary locations, but I need my characters to be rooted in a real place that I know. Roatan is the largest of the Bay Islands off the Honduran coast and is ringed by a coral reef, the third largest reef in the world. On my journey there I kept a journal and took a lot of photographs. In fact I have always kept journals when I go on holiday and how very useful this one proved to be. My photographs, now rather faded, were invaluable in helping me create the atmosphere of the island. They reminded me of local details, like the duckboard jetties that lead to some houses situated at the water’s edge. I used just such a jetty in a key scene where one of the characters delivers a suspect package to one such house and ends up hiding in the water under that house! 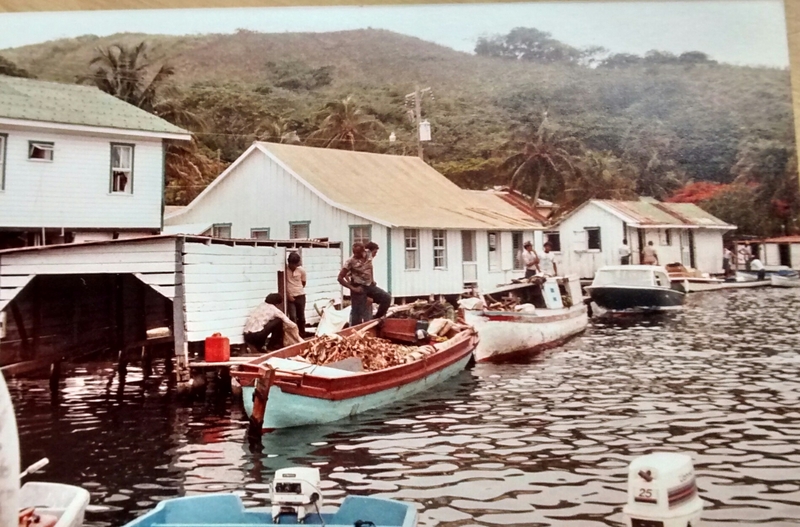 The photo with the fishing boats moored right next to the houses show how closely some communities rely on the sea. You see the working boats, often shabby and much used, alongside harbours with stylish yachts. Roatan is still a place of poverty and wealth and I worked this into the novel. 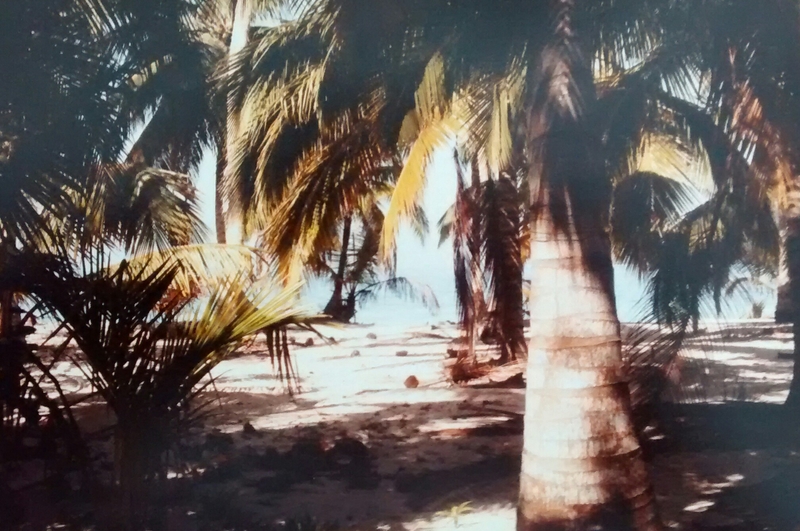 The photo of the palm trees with the coconuts lying on the white sand is perhaps everyone’s image of a paradise island. And Roatan has some glorious beaches. I wanted to capture moments of peace and beauty in the novel although the Roatan my characters experience also has a much darker side. I don’t know if it’s my television background but unless I know exact details of where my characters live I find it difficult to bring the unfolding story to life. The first half of the book is spent on an old wooden sailing boat, the El Tiempo Pasa. My memory of the geography of a boat was rusty. I consulted two friends who have sailing boats in Brighton Marina and spent time walking around their boats and again I took photos of the saloon, the berth, the galley and the deck. I was reminded how tight the space is and that a boat can be a claustrophobic place when tensions start to build. This was ideal as I wanted my characters to be put under pressure with nowhere to escape. Sailors are knowledgeable people and I felt it was essential to get the sailing details right too. If I got this wrong the reader might doubt the credibility of the rest of the story. I quizzed my two sailor friends at length about tides, about how water moves, about how every lighthouse has its characteristic flash. I consulted sailing manuals and websites. In fact the use of the boat as location required a lot more research than I’ve done for a novel before. Usefully my holiday journal was full of descriptions of the food I ate. I like to write about food! I had also listed the fish I saw when I went snorkelling and the birds on the island. This is why conch stew, live lobsters, a battered grouper and pelicans landing on a mangrove make an appearance in the novel. The setting was starting to feel very real to me again. I now needed to create four very different characters each with their own fears, desires and secrets to put in that setting. At an early stage I created character sketches for all four. There is Anna an English speech therapist who is scared of much in the physical world but is brave about emotional crises. Her partner Rob has a strong Robinson Crusoe fantasy and would love to find his own personal wilderness. The American couple Owen and Kim are less straightforward and you sense they are escaping from something. There is also a frisson of sexual attraction between the two couples. Choosing the boat and the island as my locations for After the Storm felt right. The drama could not have happened without the enforced coming together of Anna, Rob, Owen and Kim. But without doubt I could not have written it without my journal and photographs as source material. I’m using a holiday as the inspiration for my first novel – which is utterly embryonic at this stage but I am determined to write it, even if it never gets anywhere further than my laptop! I have just seen this as I’ve been away in France. For years I would start a journal whenever I went on holiday. The rest of the time I didn’t really have enough time to write. And holidays can offer excellent plot possibilities. Very best of luck with yours.